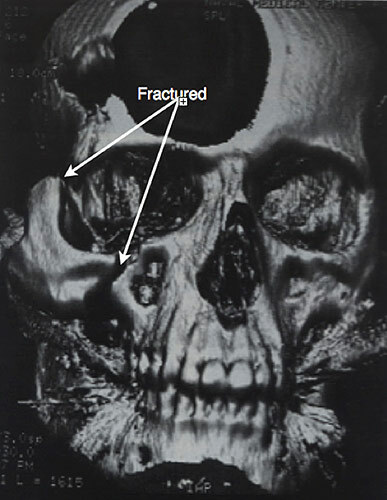 Cheekbone fractures commonly result from blunt force trauma to the face. While pain and bruising are commonly experienced with these injuries, they are usually not initially associated with functional deficits. Because of their relatively inconspicuous presentation, these fractures can easily be overlooked and left to heal on their own. If not recognized and treated in a timely manner by a facial trauma specialist, cheekbone fractures can lead to undesirable cosmetic and functional outcomes. Oklahoma City Thunder guard Russell Westbrook underwent a successful procedure to address a fracture to the zygomatic arch of his right cheek. The procedure was performed by Dr. John Joseph Rehm and Dr. Jason Hamilton with Thunder medical personnel present at the Osborne Head and Neck Institute. For more information about this procedure and patient case, please click here. What structures are involved during a cheekbone fracture? Several bones comprise the structure that is commonly known as the “cheekbone”. These bones include the lateral orbital wall, orbital rim, orbital floor, the anterior and lateral maxillary sinus walls, and a structure called the zygomatic arch. The combination of these fractures is also referred to as a “tripod fracture” or a “zygomatico-maxillary complex (ZMC) fracture”. Further complicating matters, there are several alternate names for the cheekbone area including, “malar eminence” and “zygoma”. Figure 1: The normal structures that are involved in a zygomatico-maxillary fracture (ZMC) are shown in both a frontal (left) and lateral (right) view. These fractures can lead to a depression of the cheekbone and inferior displacement of the fragment. How do I know if I have a cheekbone fracture? In the case of a cheekbone fracture, you may notice a change in the appearance of the cheek. In many cases the side of the face may look pushed in or the lower part of the eye socket (lower orbital rim) may appear depressed. However, if there is significant swelling of the face, these changes may not be apparent for several weeks. In addition, if the cheekbone fragment has been displaced far enough, it may compress nerves as well as muscles that are involved in chewing. This can result in significant pain with chewing or an inability to fully open the mouth, known as trismus. Prompt evaluation by a facial trauma specialist is highly advisable after any significant trauma to the face, especially when accompanied by swelling and bruising. During your evaluation, these specialized physicians will closely examine your face as well as order advanced imaging to reveal the presence and extent of any facial fractures. Figure 2: 3D-CT reconstruction of the skull depicting a right cheekbone fracture with bone fragment displacement. Note the alteration to the shape of the cheek. What can be done about a cheekbone fracture? The treatment of a cheekbone fracture is highly dependent on the extent of the trauma and the amount of bone fragment displacement. In cases of uncomplicated cheekbone fracture where bone fragments have not moved appreciably form their original location, close followup by a facial trauma specialist is recommended. The surgeon will evaluate the fracture and advise the patient of several precautionary measures to ensure that the cheekbone fragments do not move during the healing phase. These can include temporary lifestyle modifications or even changes to activities of daily living. The majority of cheekbone fracture cases have some moderate amount of bone fragment displacement. In this scenario, facial trauma surgeons can return the bone fragments to their original positions and stabilize them to prevent further movement during healing. This is accomplished by thin and imperceptible hardware that is inserted through small incisions made inside the mouth, along the brow, or at the temple. In some rare cases where severe trauma has occurred and surrounding critical and vital structures have been damaged, more extensive surgical intervention may be required. 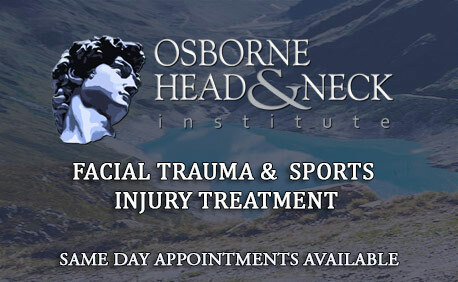 In all cases of cheekbone fracture, proper evaluation by a qualified facial trauma specialist is advisable. These surgeons are experts in selecting a treatment plan that is not only effective but also specific to your unique injury. By avoiding the extensive scarring and discomfort seen in traditional procedures, modern techniques, performed by qualified facial specialists, promote a quicker recovery time and superior outcomes.